If you’ve been reading my blog posts lately you know I’ve gravitated toward Commander-sized 1911s for my Concealed Carry handguns. I now have 3 and will use this space to refresh you on the previous two and introduce you to the third. My first Commander-sized 1911 was the Ruger. It’s the gun that converted me into a 1911 fan. 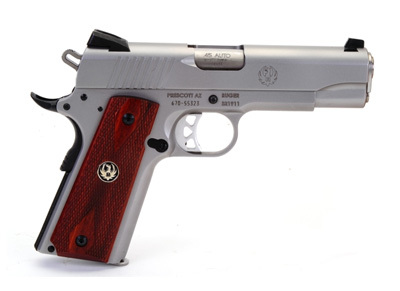 It’s one beautiful, fine-shooting firearm that is the best value I know in a 1911. Street prices are seldom above $750 and if you shop carefully and are patient, you might get one for just a little under $700. 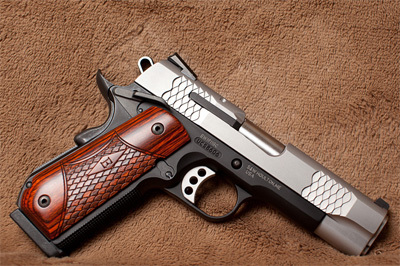 I know you can buy cheaper 1911s, but I personally don’t know where you can get this made-in-America quality for less. This gun has highly visible sights, though they’re not night sights and I find it to be very accurate. I’ve never had any type of failure to feed, failure to eject or any type of malfunction whatsoever. 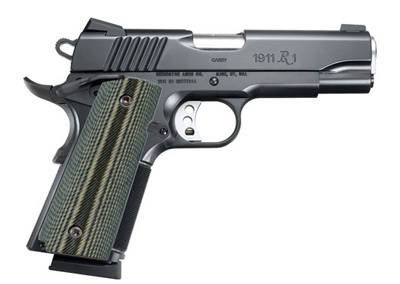 My second Commander-sized 1911 was a Remington R1 Carry. Though it came with very attractive wood grips, I swapped them out for some desert tan CV custom grips. Although it’s not Stainless Steel like the Ruger, it has a very attractive and durable black satin finish. Its edges are all rounded to help with concealment. There are three things this gun has the Ruger doesn’t: ambidextrous safety, checkered front strap, and a front night sight. Each of these adds a little value to the gun from my perspective. I like the ambidextrous safety for one reason only. It makes it easier to check to insure my safety is on when I’m wearing the gun. The checkered front strap helps a little with the grip since I changed out the factory grips for a thinner pair with a little less traction and the front night sight does help a little with aiming when it’s dark. Number three is a Smith & Wesson 1911 SCE. The “S” stands for Scandium, the “C” for Commander and the “E” for enhanced. This gun is 10 ounces lighter than the other two because the frame is made of scandium reinforced aluminum. It has a bob tail, which really does help with concealed carry, and it has Trijicon night sights front and rear. It also has fish scale slide serrations front and rear. The 10 ounces and bob-tail make a difference, really. I’d trust my life to any one of these guns. I’ve shot them each enough to have absolute confidence in their reliability and they are all capable of making one ragged hole at 10-15 feet. Lately, I’ve been carrying the S&W every day. Maybe because it’s new, maybe because it’s lighter. I’ll probably set them up on some sort of rotation because they’re all three too good to spend much time in the safe. Next Next post: Does the Weight of the Gun Really Matter for Concealed Carry?